Wall panelling is a desirable decorative feature not just in period homes, but contemporary spaces, too. Fitting new panelling can be a good way to return character to a home that has been stripped back, to fill in gaps in an existing scheme, and to help a new extension to blend in. Use these wall panel design ideas and advice to add interest to your interior. Find more design ideas on our dedicated page. Being sensitive to the period of your home is key. If you live in a listed property, you should speak to the local conservation officer to see if panelling will be an acceptable addition. Intricate dark wood panelling is not to everyone’s taste, and when used full height (see below) it can feel imposing. But there are more subtle options that go to dado height and can be painted in a soft shade to add warmth and interest (above). As well as ensuring the design is right for your home’s period, there are other aesthetic considerations. Where it is not used full height, panelling tends to look best fitted either a third or two thirds of the room’s height (below), although this may be influenced by features such as fireplaces or windowsills. You should also consider the size of the individual panel frames. Larger areas look good with bigger frame sizes, while small, awkward spaces tend to suit reeded panelling. Is real wood or MDF panelling best? Solid oak panelling is expensive, and tends to be newly fitted only where it is the true authentic option or when matching existing elements, which makes it wise to work with a specialist. Most wall panelling on the market today is made from MDF, with the intention that it is painted. Once fitted and painted, it would be difficult to distinguish it from wood. Provided the walls are fairly level, MDF panelling is easy to fit on a DIY basis. If the walls are uneven, they can usually be battened first. Ensure the company you are buying from offers good instructions before you invest. What does wall panelling cost? Expect to pay around £300 to £400 per square metre for solid oak panelling, plus installation. Expect to pay around £25 to £50 per square metre for MDF panelling, which are best painted in water-based eggshell. Panelling is a popular, often more affordable, alternative to wall tiles in bathrooms, especially in Victorian homes. It can help a built-in bath blend in with the room and hide pipework. It can also be used to build secret cupboards, or even full doors to en suites. While painted MDF designs are water resistant enough to be used in bathrooms, they aren’t fully waterproof and so should not be used in showers. It is possible to purchase original wood panelling that has been salvaged from period properties. While it adds authentic aged character, quantity can be an issue. Be certain of your room’s dimensions, and what proportions suit the style and period of your home. A complete reclaimed room, including matching doors and sometimes a fireplace with overmantel, all restored and ready to install, will be a major investment. More modest Victorian pine panels may require a mix and match approach. Where there are only a small number available they can sometimes be used to replace missing panels in a larger run, but are often repurposed as something else, such as cupboard doors. If you come across a large quantity, you may find that the dealer will only sell the set, as complete suites are rarer and more valuable. 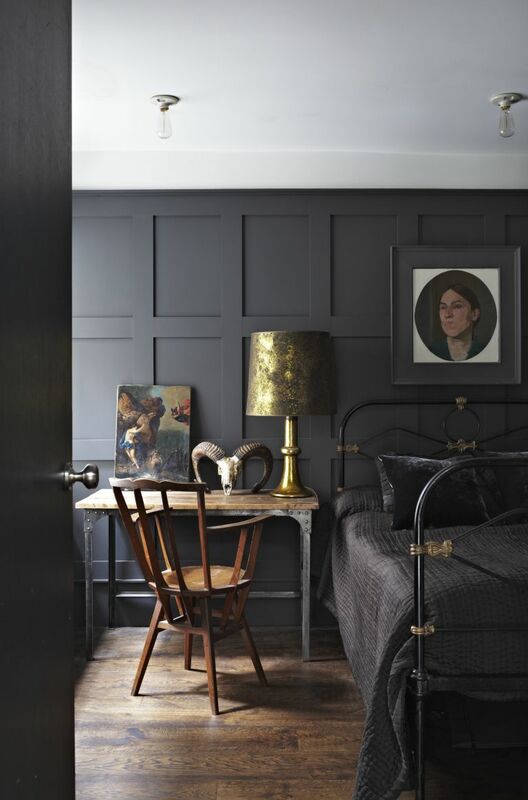 Whether yours is a period home with a contemporary appeal or a modern home that you've added panelling to for architectural interest, you can simply update panelling with a bold paint colour. Points of caution? If your panelling is original and in a beautiful wood in good condition, it's better to preserve it than paint over it; equally, intricate panel designs won't suit a bold paint colour, so if yours has already been painted, stick to a neutral paint shade. Deacon & Sandys, Cranbrook, Kent. Handcrafts solid oak panelling with a particular expertise in 16th- and 17th-century designs. Stuart Interiors, Bath, Somerset. Designs, produces and carves all styles of solid oak panelling in its workshop then installs it on site. Distinctive Country Furniture, Martock, Somerset. Specialises in 16th, 17th and 18th century-style oak panelling, which it handmakes and fits on site. Finepanel.co.uk. Produces a range of MDF designs for home delivery, which are easy to install and paint. The English Panelling Company. Nationwide delivery of different styles of panelling for home installation and painting. Oakleaf, Keighley, West Yorkshire. Highly realistic aged oak-effect moulded panelling made using masters selected from 17th-century designs, and hand-stained. Wall Panelling Experts. Offers a wide range of options for home delivery including oak veneer, pine and water-resistant MDF. Wall panelling originally served a practical rather than decorative purpose: in the days before insulation was used in buildings, applying an extra layer of timber would help to warm up rooms with cold stone walls, and would also cover up damp patches. Early examples from the 13th Century tended to be plain vertical boards, but over time wood panelling evolved to become an art form and was often carved with beautiful designs. Today, you can choose between traditional polished wood and colourful painted MDF for the perfect period home interior. Framed panelling became popular from the 14th Century, and was usually oak, which might be left plain or be carved with decorative detail. Elaborate linenfold designs, which resembled folded linen, emerged as a trend in the late 15th Century, while in Tudor and Jacobean times the fashion was for small squares or rectangles, with the wood either left unfinished or treated with wax or varnish. The panelling was often topped off with decorative carved capping. In the Georgian era, panelling took on a more classic appearance, with larger, simple panels of painted softwood. Over the period, full-height styles began to be replaced by dado-level panelling. The Victorians continued this trend for shorter sections, although panelling did become less popular until the Arts and Crafts movement, where simple oak designs fitted up to head height were preferred. Every garden needs somewhere to store tools, accessories and furniture. Find hints and tips for how to choose stores or garden sheds, plus our pick of designs.